While the U.S. has what many consider the most powerful military force in the world it has many perplexed that Russian President Vladimir Putin has been "running circles" around Barack Obama both in a political sense and militarily, in Syria. From the political maneuvering in 2013 when Putin was credited by many with preventing what many believed would be a world war, to the present day Russian bombing campaign against ISIS in Syria, which the concensus believes has been more effective in a matter of weeks than the U.S. led campaign against ISIS in Syria has been after nearly a year, we have seen Putin constantly dominate Obama and proving once and for all why you do not pit a "community Organizer aka Obama against a former KGB agent. How does a country with a weaker military force manage to dominate a country with the most powerful military force? As Russia Insider explains.... with shock and awe tactics which implements political strategy to highlight the weakness of Barack Obama's "Commander-in-Chief" decisions. Putin’s cut-rate variant on shock-and-awe is exemplified less by military muscle and more by the triumphant sarcasm of his foreign minister, Sergei Lavrov, who offered to provide air support for the moderate “patriotic opposition” on condition that the US identify those moderates on the ground. Russia, which could not compete symmetrically with the US militarily, must rely on more subtle chessboard moves. One of the early effects of the Russian psychological operation has been to force into the open previously secret American operations in Syria, as well as the fact that much of the Syrian uprising has been taken over by extremists. It all comes right out of the so-called Gerasimov Doctrine of non-linear war: Keep your opponents off balance and change tactics frequently, probing for weaknesses to exploit. Tactics-wise, Putin has pulled quite a few rabbits out of his hat: a no-fly zone of his own, sophisticated military hardware ranging from cruise missiles and fighter planes to powerful communications jammers, successful diplomatic initiatives — in 2013, he was instrumental in forging an agreement that resulted in the destruction of Syrian chemical weapons stockpiles — and most recently a surprise visit by Assad to Moscow. From nearly 200 generals, flag officers and other high-ranking officials purged from the U.S. Military under Obama's presidency, to the more recent admission from the Army that it has cut 80,000 soldiers since 2010 and plans to reduce the force by another 40,000 by the end of 2017, we are seeing the dismantling and deliberate weakening of America's military force. While Obama has been busy dismantling and demoralizing the U.S. Military, Russia has been expanding and making technological advances that has former U.S. Army Psychological Warfare Offier Scott Bennett asserting that Russia has "far superior" military technologies than the Americans. Back in November 2014 a website named Voltairenet.org reported on an incident that occurred in April 2014, where according to Voltaire "The State Department acknowledged that the crew of the destroyer USS Donald Cook has been gravely demoralized ever since their vessel was flown over in the Black Sea by a Russian Sukhoi-24 (Su-24) fighter jet which carried neither bombs nor missiles but only an electronic warfare device." This device "disabled all radars, control circuits, systems, information transmission, etc. on board the US destroyer," leaving the USS Donald Cook defenseless and sitting ducks. While the MSM avoided highlighting this event, another recent example of Russian military technology has become headline news as Russian media outlet Sputnik reports "Russian Jamming System Blocks All NATO Electronics over Syria." From the combat zone in northern Syria comes news of the deployment of a new Russian electronic jamming system which can reportedly blind radar, disrupt electronic guidance systems, and interfere with satellite imagery as well. On October 21, 2015, Foreign Policy stated "In Ukraine and Syria, Russian forces are using high-tech equipment to jam drones and block battlefield communications -- and forcing the U.S. to scramble to catch up," in an article titled "Russia’s Winning the Electronic War." Russia is also expanding their presence in the Arctic with recent news reports showing they are nearly done building their biggest Arctic military base, the Russian military plans mobile nuclear energy plants in Arctic by 2020, and Defense News reports "Russia Building 'Arc Of Steel' From Arctic To Med." 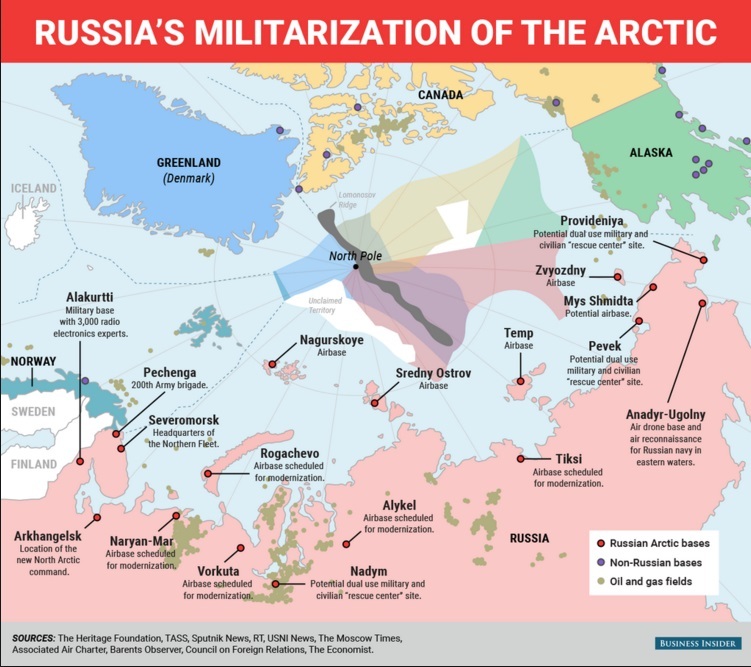 Reuters reports "Russia and America prep forces for Arctic war." 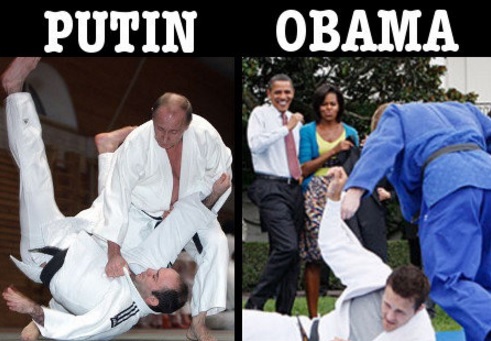 From psychological warfare to politics to military technology, Vladimir Putin has been dominating Barack Obama and doing so on the world stage, proving that his military training is far superior to America's "Community organizer-in-Chief." It could literally take decades to change the optics of weakness that Obama has created regarding America, politically and militarily and that is only if the psychopath puppet-masters controlling the "powers that be" don't takes us into a nuclear war first.